If you're a caramelized onion fan, these are the burgers for you. There is a technique to these burgers. For the onions, it's key to thinly slice them, salt them and let the excess water from the onions draw out. The result is dry onions that will adhere to the patty well and they'll caramelize perfectly too. It's definitely worth the time to take that step so don't skip it! Also, these are burgers made on the stovetop - grilling these may not do so well. Combine onion and 1 teaspoon salt in a bowl and toss to combine; transfer to a colander and let sit for 30 minutes, tossing occasionally. Using tongs, transfer onions to clean dish towel, gather edges and squeeze onion dry. Season with 1/2 tsp pepper. Divide onion mixture into 4 separate mounds on a rimmed baking sheet. Portion beef into 4 lightly packed balls and season with steak seasoning (or salt and pepper). Place beef balls on top of onion mounds and flatten beef firmly so that the onion adheres and patties measure 4 inches in diameter. Melt butter with oil in a 12-inch skillet over medium heat. 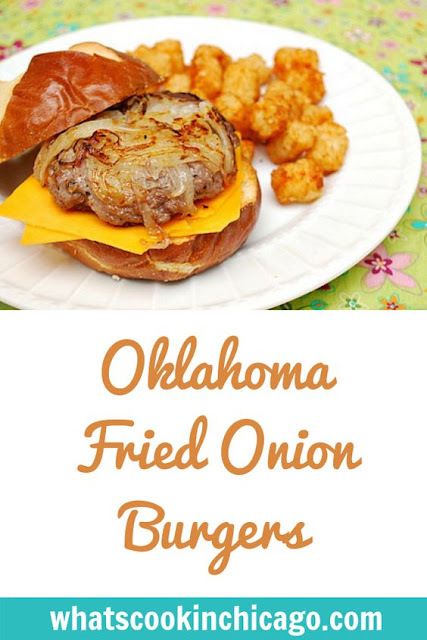 Using spatula, transfer patties to skillet, onion side down, and cook until onion is deep golden brown and beginning to crisp around the edges, 6-8 minutes. Flip burgers, increase their heat to high and cook until well browned on the 2nd side, about 2 minutes. Place 1 slice of cheese on each bottom bun. Place burgers on buns, add desired toppings and serve. 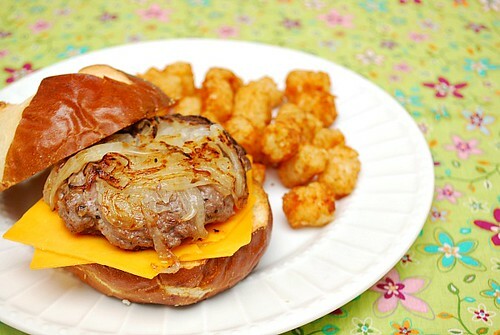 I've never had fried onions on a burger, but I have done grilled onions - especially good with mushrooms and swiss!